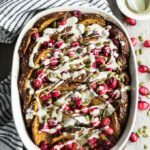 Cranberry Pumpkin French Toast Bake brings together the flavours of fall in a decadent brunch bake! With layers of bread dipped in a pumpkin-egg mixture, and topped with fresh cranberries, pumpkin seeds and white chocolate, this is the ultimate holiday breakfast! Pre-heat oven to 350F and grease an oval baking dish (I use a 8″ x 10″ dish). In a medium-sized bowl, whisk together the eggs, milk, pumpkin and pumpkin spice. Dip each piece of bread into the egg mixture, making sure to coat each side, and place in the prepared baking dish. Ensure each piece is layered into the dish upright and horizontal. Depending on the shape of your dish, you may wish to curve the pieces of bread on the ends and overlap them in the middle. Pour the remaining egg mixture over the bread. The bottom of the bread will be swimming in egg, but this will bake around the bread and keep the french toast together. Sprinkle the cranberries on top of the bread, tucking some in between slices to ensure they are baked in throughout the french toast. Bake for 40-45 minutes, or until the french toast bake is firm and the top is browned. Remove from oven and place on a wire cooling rack. Add the white chocolate chips and coconut oil to a microwave safe bowl and microwave for two 30 second intervals, stirring in between intervals. Repeat if necessary until chocolate is melted. Drizzle the white chocolate over the french toast bake, and sprinkle on the pumpkin seeds. Serve warm. Store any leftovers in the fridge and enjoy within 2-3 days. Leftovers can be microwaved or re-heated at a low temperature in the oven. Make sure the bread is thinly sliced so it easily shapes around the baking dish. The bread should also be stale. If it’s too fresh, the french toast may turn out mushy.